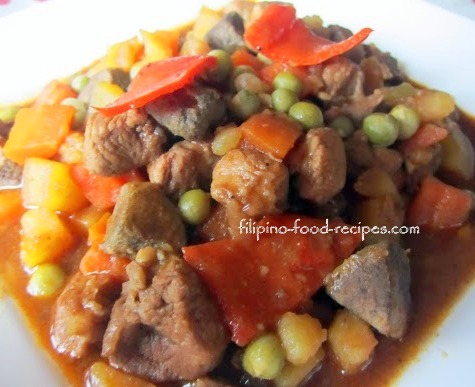 This Menudo Filipino Recipe is made with chunks of pork and liver cooked in tomato sauce with potatoes, chickpeas, green peas and bell pepper. Any Filipino can tell you that. However, here in the U.S., the Mexican Menudo is all the more popular. A tomato based soup made with tripe or the lining of beef stomach and pig's feet served as breakfast as a cure for hangover. It was even featured in the Food Network. Well, my mom's pork menudo is like no other. Not your typical recipe found in cookbooks, she pre-cooks the pork chunks in a little vinegar and soy sauce until the meat is tender before sauteing and adding the other ingredients. The deep red color of the dish is from achuete or annato seeds. Potatoes are cubed, just like the pork and liver and the bell pepper is added towards the end so it doesn't get wilted too much. 1 In a medium saucepan, mix together cubed pork meat, vinegar, soy sauce and about half of the water. Cook until meat is tender, or add more water if needed. 2 On a separate saute pan, heat the achuete seeds in oil and remove the seeds. 3 Saute the garlic, onion and tomatoes. Add the boiled pork and cook for a few minutes (leave out the liquid). 4 Add a cup of the chicken broth and potatoes and simmer until potatoes are tender. Add more broth if it is drying out before the potatoes get tender. 5 Add the liver, chickpeas and bell pepper and simmer for 3-5 minutes. Season the pork menudo with salt and pepper. 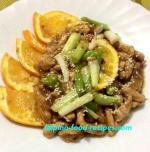 If you are not a fan of pork liver, substitute with canned liver spread instead. Cut the pork slightly bigger than the potatoes because it will shrink in size one cooked. Liver, be it pork, beef or chicken, can tough and inedible when overcooked so make sure you add it towards the end of cooking.